Or, you could read the following excerpt about Pyle from my forthcoming book, Covering America. I have chosen this selection because it gives a glimpse of Pyle before he was famous. As the war drew closer, more and more Americans began facing up to it and thinking about their places in it. 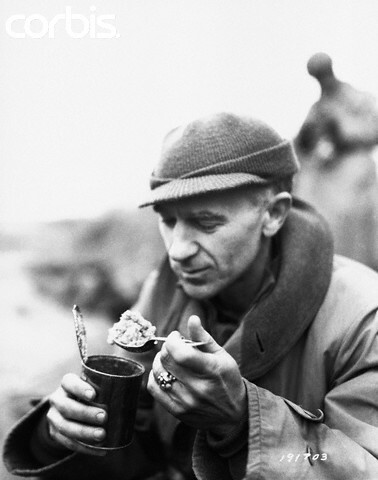 One of them was a newspaper columnist in his late thirties named Ernie Pyle. The son of farmers, Pyle left his small town in Indiana and, in the space of a few years, became the best-known and most-loved journalist of his generation. Broke, they landed in New York, and Ernie went back to work, as a copy editor at the Post. He didn’t like New York, so he jumped when he got a letter from Lee Miller, an editor at his old paper in Washington. Miller, who was on the rise in the Scripps-Howard operation, offered him a spot on the desk at the Washington Daily News. There, just months after Lindbergh’s historic crossing of the Atlantic, Ernie launched the first regular column in the country devoted to the field of aviation. He spent most days at his desk job, then spent most evenings hanging around at the airfields around Washington and writing his column. While he was busy, Jerry began drinking. At one point, Ernie and Jerry took another long trip across the country. When they got back, his newspaper was facing a problem: the syndicated columnist the newspaper usually carried, Heywood Broun, had gone on a vacation and suspended his column. To fill the space, Pyle pitched in and wrote eleven pieces about his recent trip. Those columns caught the eye of the top editors at Scripps-Howard, and Ernie was rewarded by having one of his life’s wishes fulfilled: he was given his own column, to be filled by whatever material he could find by traveling the USA. The man who could write like talking was a jumpy bundle of moods, habits, and gifts. He was a scrawny fellow who managed to endure terrible hardships. He had a loveless, childless marriage to a woman he was apparently quite devoted to. He was a hypochondriac who was actually sick a lot. A heavy drinker, he managed to find a wife who drank far more. He was also, curious, sympathetic, and graceful. He could walk up to just about anyone or any group of people and strike up a conversation; he wasn’t interviewing, exactly, he just seemed to be talking, and later on, he would figure out what to use in his columns. He had the reporter’s eye for detail, and a good ear. He was also a self-taught master of simple, direct English prose. –Go somewhere, find something new, interesting, and original to write about. –Talk to some people, usually total strangers. Find a quiet place to write. Bang out four pages of copy. –Find a way to transmit it to the home office. –Deal with editing changes. Deal with business matters – fan mail, hate mail, expense accounts. –Check into a motel. Find something to eat. –Tomorrow, do it all over again. In 1938, Pyle’s career took a big step when his column went into syndication. This was a business decision that meant more than just business. The Scripps-Howard company owned its own syndicate, known as the United Feature Syndicate. It operated like any other: the company acted as a broker, buying material from writers and selling it to newspapers. Usually, this was done through long-term contracts on both ends of the deal. That is, the writer would be obligated to write on a fixed schedule (whether he or she felt like it or not), and the syndicate would distribute the material on a schedule. At the receiving end, the newspaper customers could use the material or not, and they could display it prominently or not. For all writers who work this way, there are three measures of success: the number of customers who contract with the syndicate to buy your work, the amount of money that contract brings in, and the display (or “play”) that your work gets in the pages of those newspapers. A column about chess or sewing might bring a modest income and receive modest play in a regular corner of an inside page. But a controversial or “hot” column like Winchell’s might get a guy on Page 1 and might even make him rich. For Scripps-Howard, syndication meant that Ernie’s column would now be for sale to newspapers outside the chain, which might dilute its value to Scripps-Howard editors, but it would also mean that the company could make a lot more money from the words it was already paying Ernie to write anyway. Eventually, they ironed out the terms, and Ernie’s column became available to many, many more readers. In late 1939, Pyle embarked on a long trip, from Seattle to California (where he found a bed-making contest in San Francisco to write about, as well as a chinchilla farm), then to New Orleans and on to Central America. That put him in the vicinity of the Panama Canal, which was emerging as a strategic military chokepoint in the growing world conflict. Ernie wrote about it reluctantly. “I hope the office won’t even suggest that I do any military columns down there,” he wrote a friend, “If there’s one thing in this world I hate and detest, it is writing about the Army” . . . .